I wasn’t particularly impressed with the first book in The Burned Man series by Peter McLean, but being behind in my ARC reading, I already had the second (and third) books on my Kindle for reading and review. Dominion is the second book in the series. There’s nothing particularly new here in the second book. This is still an urban fantasy with a lot of the typical urban fantasy tropes. And if Drake (the first book in the series) felt like a rehash of a lot of popular fantasy, then Dominion is even more so. In my review of Drake I wrote: “Drake comes across as a Harry Dresden type – male, about the same age (?) with a talent for magic and putting demons in their place. But Don Drake isn’t quite as smooth as Harry Dresden. Drake is an alcoholic gambler who gets lucky more often than not.” This continues to hold true and if anything, he has become even less likable. And when you are a mostly character-driven series, having an unlikable protagonist is not helpful. Let’s talk a little bit about profanity…. I typically don’t mind profanity in the literature I read. I work in professional theatre and anytime a company I work with gets a letter from a patron complaining about the profanity on stage, I tend to roll my eyes and say, “Get real.” I use profanity in my own writing and in my everyday speech. Not a lot, but more than my wife would like! But this is all to say that I’m not against the use of swear words or curse words or however you might want to define some language (and the only reason I’m not giving examples is because Amazon will not let me post a review with profanity in it). The use of profanity will go a long way in establishing what sort of character someone is and in this case, Don Drake’s use of profanity goes a very long way in making me not like him. In particular, the use of the ‘C’ word (a vulgar term to describe a particular part of the female anatomy) was so off-putting that it took me out of the story. I immediately wanted nothing more to do with these characters. And this made me think about the use of profanity and I realized that in my everyday life, I would not sit around with people who speak this way. I would not go out and have a drink with someone who talks about someone being a ‘c***ing b**ch”. In fact, I would make excuses to leave if I were with someone who spoke this way. And if I wouldn’t associate with people like this, why would I ever enjoy reading a book about people like this? Perhaps, if the people in the book in question were SUPPOSED to be despicable and unlikable, then yes, but when they are the ‘heroes’ of the story … ? No. I get that there are plenty of readers out there who don’t mind this. Possibly even relish it. But I’m not one and this book just doesn’t appeal. These characters don’t need to be my friends, but I do need to find a reason to get behind them and root for them if I am going to read about their adventures. Looking for a good book? 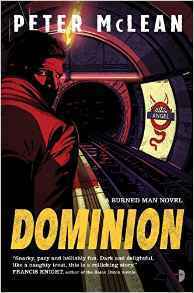 Dominion, by Peter McLean is the second book in the Burned Man series with an unlikable main character in a setting that struggles to stand apart from other urban fantasies.